The author of the beloved classic Italian Family Cooking teams up with his daughter for a book that is part recipe treasury, part family memoir--and totally irresistible! Scrambled Eggs with Scallops and Morels, Mesclun Salad, and Strawberry Flan make a delicious quick spring meal, while Grilled Duck Breast, Warm Beet and Potato Salad, and Sliced Pears with Cheese combine spectacularly for a fast fall dinner. 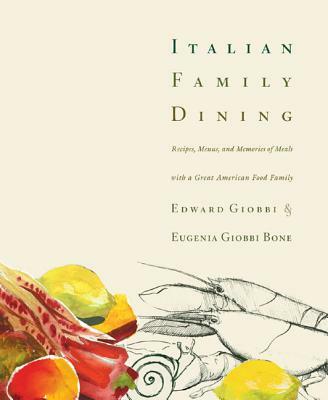 Throughout the book Eugenia Bone shares warm family reminiscences--and the recipes for Italian-style dining are simple but elegant, created by one of America's great home cooks, Ed Giobbi. EDWARD GIOBBI is the author of several cookbooks, including Eat Right, Eat Well--The Italian Way and the James Beard Award-winning Pleasures of the Good Earth. He is also a well-known painter and sculptor whose artworks are found in many private and public collections, including the Whitney Museum in New York. He resides in Katonah, New York.